The base was attacked by 353 Japanese fighters, bombers and torpedo planes in two waves, launched from six aircraft carriers. All eight U.S. Navy battleships were damaged, with four being sunk. All but two of the eight were raised, repaired and returned to service later in the war. The Japanese also sank or damaged three cruisers, three destroyers, an anti-aircraft training ship, and one minelayer. One hundred eighty-eight U.S. aircraft were destroyed; 2,402 Americans were killed and 1,282 wounded. The power station, shipyard, maintenance, and fuel and torpedo storage facilities, as well as the submarine piers and headquarters building (also home of the intelligence section) were not attacked. Japanese losses were light: 29 aircraft and five midget submarines lost, and 65 servicemen killed or wounded. One Japanese sailor was captured. There were numerous historical precedents for unannounced military action by Japan. 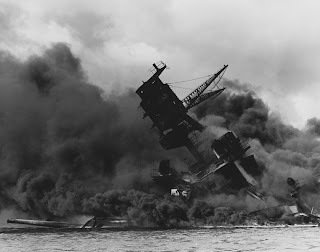 However, the lack of any formal warning, particularly while negotiations were still apparently ongoing, led President Franklin D. Roosevelt to proclaim December 7, 1941, "a date which will live in infamy".